I make each item by hand with care, and I am proud to say there are no two that are exactly alike. 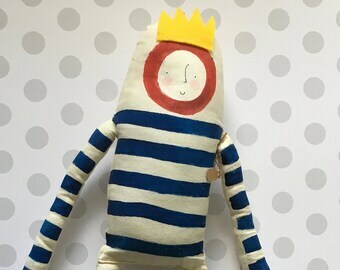 These plush dolls are one of a kind and strange for kids (and kids at heart) who push the envelope and think outside the box. They have their own personalities and stories and are ready to decorate your home with their unique looks and kickass individuality. The whale that ate Batman!! Awesome!! It turned out perfect. Thanks so much! 🦇❤️we LOVE it!! Just love this whale. Thank you. Very nice handmade paper doll. Grateful for all the positive feedback and reviews as I prepare for next Thursday's wine walk. Thanks so much, you all truly many my dreams come true. I believe in making dolls that are unique and sophisticated for anyone who pushes the envelope of style and creativity, and thinks outside the box. Whether they be playthings, friends, gifts or decorations, these dolls will add joy and intrigue to a bed, wall, couch or celebration. That's basically what I love doing : showing the amazing, beautiful side of uncommon people through plush dolls and paper goods. I hope you enjoy looking around the shop! I also take custom orders - if you have a detailed idea of what you want, or just want to start from the ground up, send me a message and we can start making it a reality! Orlando based freelance illustrator and doll maker with a BFA in design. Welcome to Blue Raspberry Designs! I have always wanted to let others into my world through the simple pleasure of unique toys. 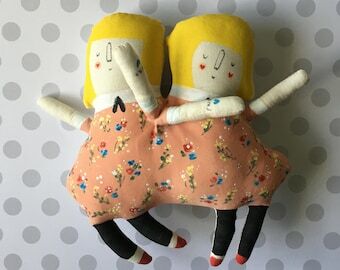 Each doll is carefully designed with his or her own personality, fun fabrics, colors and textures to evoke a sense of vintage elegance that everyone, including the little ones, can enjoy. Each doll is a small work of art, carefully crafted with special attention to detail. They are illustrations come to life. These dolls are great for bringing color and personality to any room, adding a fun and cuddly friend to a child's collection or even hanging on a wall. My goal is to provide unique toys for unique people. I believe everyone is different and beautifully weird. Each doll takes time and care to make and I want each person to be happy and satisfied with their order. Once an order has shipped, the sale is final. For any questions, check out my cancellation policy or contact me with specific questions. If the order arrives with any problem whatsoever, don't hesitate to contact me. I accept payment through Paypal and direct checkout (major credit cards ) as well as Etsy gift cards. Cancellation: If an order is cancelled before i have begun working on it, a refund can be issued and no artwork will be sent. However, once I have completed a doll or begun work on a custom piece, I will not be able to cancel the order. For made to order items, please allow time for the item to be made before shipping. This usually only takes 5-10 days, but more time may be needed for large or very detailed orders. Feel free to contact me before purchasing to ask how long a specific item will take to prepare. If an item is needed quickly, let me know as soon as possible so I can work with you. Each item is carefully shipped and delightfully packaged. If rush delivery is requested, you may need to pay additional shipping fees depending on how much the cost of shipping changes for the shop. A custom listing can easily be set up to make special requests easily available to you, so don't be afraid to ask! All dolls and illustrations are handmade with care in a smoke-free home. For younger children, feel free to contact me with any questions. any small parts, beads or choking hazards can easily be removed at no cost prior to shipping. The paint I use is safe to smell and touch and is meant to last. Still, it is best to keep painted areas of the doll out of little mouths as a precaution and to preserve the colors and keep the image from running. If you are interested in large orders, consignment etc, contact me. I love working with new people.